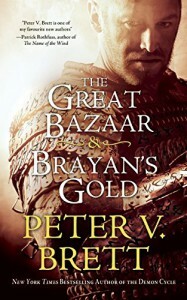 The Great Bazaar & Brayan's Gold - Peter V Brett - review - There Are Inkspots On My Page! These two novellas were my introduction to Peter Brett and his Demon Cycle, and I must say, they were pretty great. There are just enough references to the greater series for existing fans, and enough explanation for new readers to make it perfect for everyone, regardless of whether you’ve read the series or not. And really, if this is your first exposure and you don’t want to read more afterwards, you may be a little crazy. My favourite of the two was The Great Bazaar, Arlen is a bit older than in Brayan’s Gold, and has settled into himself a bit more. Plus, it was just a good story. I’m sure this happens in the actual series, but I do like how the characters are not infallible - they make mistakes and have to live with the consequences of them, and I think I’ll really enjoy seeing how these two experiences shape Arlen in the rest of the series. This collection is rounded out with a deleted scene from The Warded Man, which didn’t leave much of an impression on me to be honest. Probably why it was deleted! There’s also a dictionary and grimoire of the wards, but I suspect that holds more for someone familiar with the rest of the series. If you’ve read the series and want to know more about Arlen’s history: grab this book. If you haven’t read the series and want to know whether it’s worth your time: grab this book.